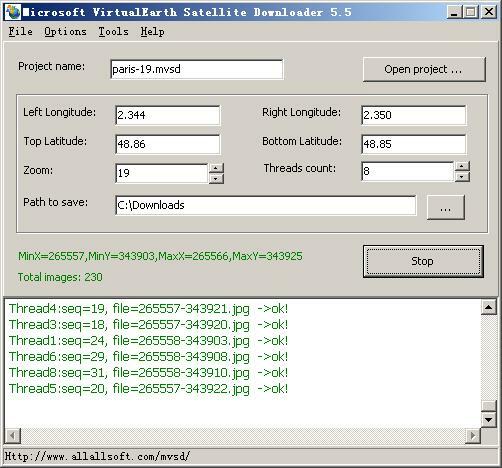 Microsoft VirtualEarth Satellite Downloader is a cute tool that help you to get small tile satellite images from Microsoft VirtualEarth. All downloaded small images are saved on the disk. You can view downloaded maps by Satellite Viewer Or you can combine them into a big BMP map. Microsoft VirtualEarth Satellite Downloader is usefull software supports proxy server. you can easily get the longitude and latitude of each downloaded small tile image. a cute tool help to get small tile satellite images from Microsoft VirtualEarth. ...... not download high precision images. How to download satellite images with Microsoft VirtualEarth Satellite Downloader? Microsoft VirtualEarth Satellite Downloader is easy to use. Firstly, enter a project name, such like "MyNewProject.mvsd". All project files are saved as *.mvsd. If you want to continue a old project, click button "Open project". There are 4 parameters (Left Longitude, Right Longitude, Top Latitude, Bottom Latitude) to define the area scope of images that you want to download. The zoom parameter define the image precision. and you can define how many threads you want to start to download at the same time. Select a path to save the project and downloaded images, then click button "Download", OK, start downloading now. When downloading, the log window will display the downloading process. When finished, the log will be saved to a file. Word repair software to repair corrupt word files and recover data from them. Satellite-TV-PC.net Turn your Computer into a Super TV! Add power to your Visio drawings with this tool set. Evidently speed up document writing with Microsoft Word. Mac OS X satellite image viewing program. Qweas is providing links to Microsoft VirtualEarth Satellite Downloader 7.85 as a courtesy, and makes no representations regarding Microsoft VirtualEarth Satellite Downloader or any other applications or any information related thereto. Any questions, complaints or claims regarding this application Microsoft VirtualEarth Satellite Downloader 7.85 must be directed to the appropriate software vendor. You may click the publisher link of Microsoft VirtualEarth Satellite Downloader on the top of this page to get more details about the vendor.